Filling in a canvas in a group typically takes between 30 and 45 minutes, and helps you to develop shared understanding around the organization itself, its domains, and your circles or teams. 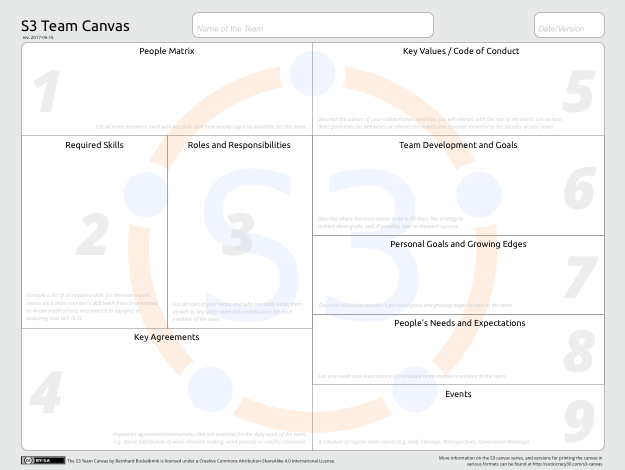 Each canvas consists of distinct sections that help you explore various aspects of your organization, domain or team. The sections are numbered to indicate the order of moving through a canvas. When downloading a canvas, you will receive a 2 page pdf file: the first page is a guide with a brief explanation for each section and the second is the actual canvas. Head over to the S3 Canvas Page to take a look or download the canvases.